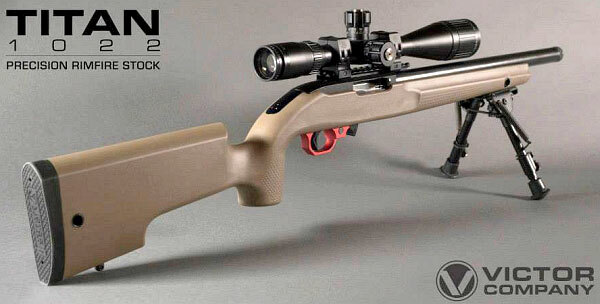 Victor’s Titan 1022 Precision Rimfire Stock features a vertical-style grip and a wide, beavertail forearm with molded nibs for enhanced grip (max barrel diameter is 0.920″). 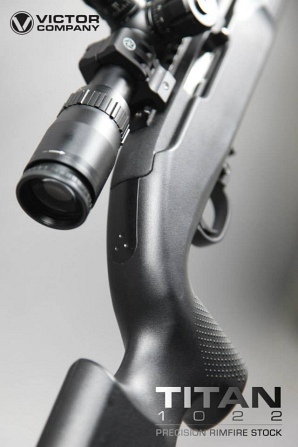 In the rear, the buttstock features a cut-out for the user’s off hand with a deeper “keel” for riding the bags. With “Introductory Pricing” of just $169.99, the stock is available in two colors: Flat Dark Earth (above) or Matte Black (below). 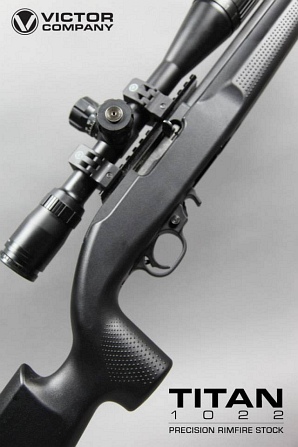 A Ruger 10/22 never looked so good. Visit www.victorcompanyusa.com for more details. This table shows the corresponding distances at which a 10 mph full-value crosswind pushes a .22 LR bullet and .308 projectile roughly the same amount. Values are based on 0.130 BC for a 40gr .22 LR bullet, and 0.496 BC for 175gr .308 bullet. Along with the training benefits, rimfires are fun to shoot, with less noise, less recoil, and a much lower cost per shot. If you like competition, many clubs around the country offer rimfire tactical matches, or something similar (multi-distance matches shot from a variety of positions). With paper and/or reactive targets from 25 to 150 yards, tactical rimfire matches are fun and challenging. Share the post "Victor Company USA Now Shipping $169.99 Stock for 10/22s"
To help in training you should really match up drift at the same MOA instead of the the same number of inches. The .308 at 440 yards drifts 14.5″, but this is only 3.3 MOA compared to a drift of 7.1 MOA for the rimfire. The rimfire at 200 is similar to a .308 at 840 yards in terms of MOA drift. Saw these stocks at SHOT, they are VERY impressive for the price. Very well built and very rigid. Agree with Rob, inches is not the correct way to compare the ballistics. Comparison should be based on MOA or mil values.